Just like Agent Coulson (Clark Gregg) got his own poster for The Avengers, one of S.H.I.E.L.D. 's head honchos gets his own poster too. USA Today has just unveiled a character poster for Alexander Pierce, the questionably trustworthy head of the unique terrorist fighting agency, who is played by the legendary Robert Redford in Captain America: The Winter Soldier. 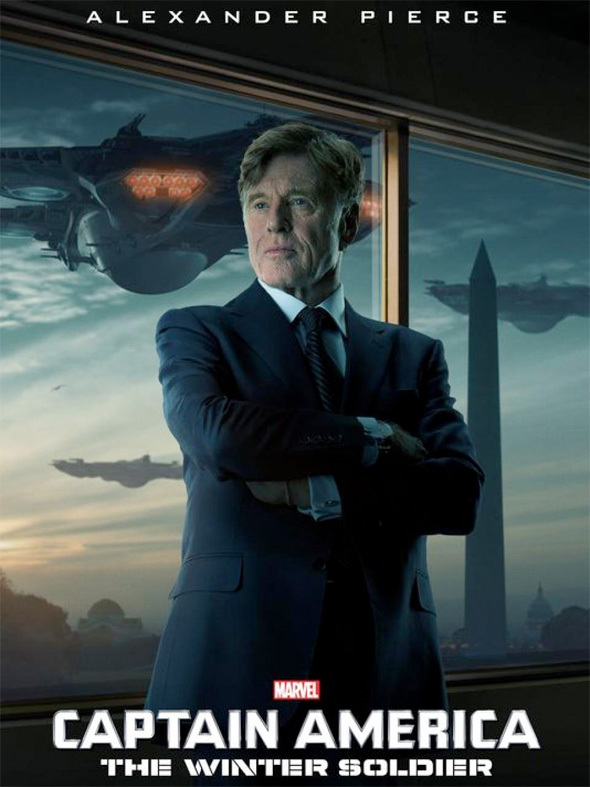 The addition of Redford to the cast of a film like this turned a lot of heads, and it might catch the attention of some older theater-goers who may not be into the whole comic book movie scene. This would be a good one to reel them in since the film is said to be like an old school 70s political thriller. We'll find out when the Marvel sequel hits theaters in April. Look! Captain America: The Winter Soldier is directed by Anthony & Joe Russo ("Community" and "Arrested Development") with a script from Christopher Markus & Stephen McFeely (Captain America: The First Avenger, Thor: The Dark World). Chris Evans reprises his role as Captain America, still struggling to adjust to present day life, when a powerful new enemy emerges. Scarlett Johansson also returns in the film as S.H.I.E.L.D. agent Natasha Romanoff along with Anthony Mackie, Emily VanCamp, Robert Redford, Frank Grillo and Sebastian Stan. Disney will release the Marvel sequel in theaters next spring starting April 4th. Paul Bettany has been confirmed to play The Vision in Avengers: Age of Ultron!